ELEX EasyPost Shipping Method for WooCommerce helps you print UPS shipping labels along with FedEx and USPS. Users more benefits with EasyPost than individual integrations. Recently, WooCommerce shipping has been sorted out with the introduction of shipping integrations like USPS, Stamps.com, DHL, AustraliaPost, EasyPost and many more. ELEX is an eCommerce store which has helped more than 30,000+ stores with all the above-mentioned shipping integrations. Among all of the above integrations, EasyPost is one of the advanced and versatile integrations we offer. It brings multiple shipping services at one place which helps a store owner in multiple ways. In this article, we’ll discuss one such integration through ELEX EasyPost Shipping Method for WooCommerce i.e. UPS shipping services. United Parcel Services(UPS) is a global fulfillment service provider and is one of the direct competitors of FedEx in the United States and abroad. Apart from retail-based shipping, UPS provides services in cargo, and freight shipping too. It is also quite similar in function to DHL Express, which primarily focus on express international delivery of packages and media mails to more than 220 countries. Most of its services are time-definite and guarantee a swift delivery. 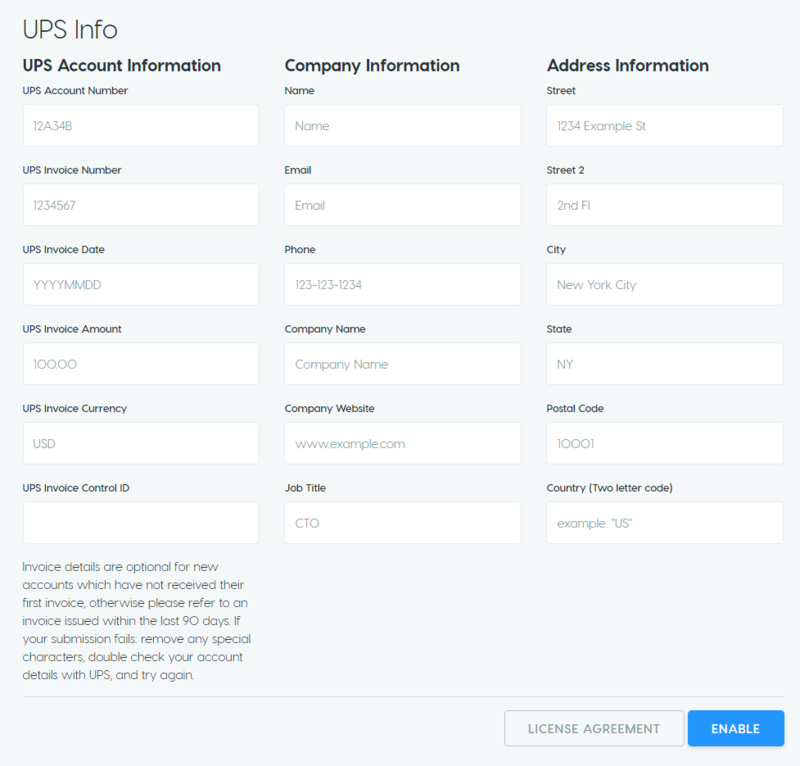 As we’ve discussed, the first step towards the integration of UPS to your EasyPost account is to include the UPS account details through the Easy Post dashboard. Before we move ahead, I assume that you have logged in to your EayPost accounts. To do so visit EasyPost. As you log in you can find your EasyPost ‘dashboard’ on the top-right corner of the screen. Now you’ve got to click on the ‘Dashboard’ to open your account area. The accounts area includes all details of shipments, tracking information, insurance, all batches of packages, complete reports, and some additional resource. To add your UPS account, click on your email id and then select ‘carrier accounts’. You get the option of “Add Carrier Account” where you can search for UPS or scroll down to UPS. Now click on UPS to get the following dialogue box. You need to be extra careful while creating an account with UPS and filling the form here in the EasyPost to add UPS. If you make even the slightest mistake in the addresses you’ll come across an error like: “Something went wrong. The country associated with Shippers ShipperNumber must be the same as the shipments Shippers country. The UPS account tied to the Shipper Number you are using is not yet fully set up. Please contact UPS.” Once you fill all necessary details, you can find you UPS account in the Carrier Accounts section. The screenshot here shows the email id where you need to click to find the ‘Carrier Accounts’ option. As soon as you add UPS to your EasyPost Dashboard, you can move to your WordPress/WooCommerce store to set up the EasyPost Shipping Method Plugin. The screenshot here shows FedEx and UPS account in the dashboard. Enable Real-time rates for showing live shipping rates from USPS, FedEx, and UPS to your customer. Select all countries you want to offer the shipping services. Choose UPS in the EasyPost Carrier’s Section to get the UPS shipping services in the list shown below. Choose from the following services from UPS. Here you can give desired names to these services, and include adjustments to the returned rates in terms of $ or % of the returned rates. Finally, you get the option to enter a return address. In case the package is to be returned, it will be delivered to the entered address. If not selected the origin address remains to be the return address. Choose from the two types of packing options. Pack items Individually- This option packs items in individual boxes and shipping rates are based on the weight and dimensions. One box contains one item and its shipping rate is calculated separately. Pack into boxes with weight and dimensions- This packs item into boxes till it is filled. The next box is considered only when the first box is filled with least empty volume. With the packaging settings, you can proceed and generate packages which are followed by Printing of Labels. Let’s explore the entire process happening in the Edit Order page. Before we move to the Edit Order page, let’s place a sample order. If you have the plugin installed, you’ll find all the shipping rates by USPS, FedEx and UPS listed on the cart/checkout pages. Since we are to learn to print of UPS shipping labels, let’s assume that your customer chooses UPS service for shipping. So select any of the UPS services here and proceed to complete the transaction. Once the order is placed, move to the Oder Edit page. 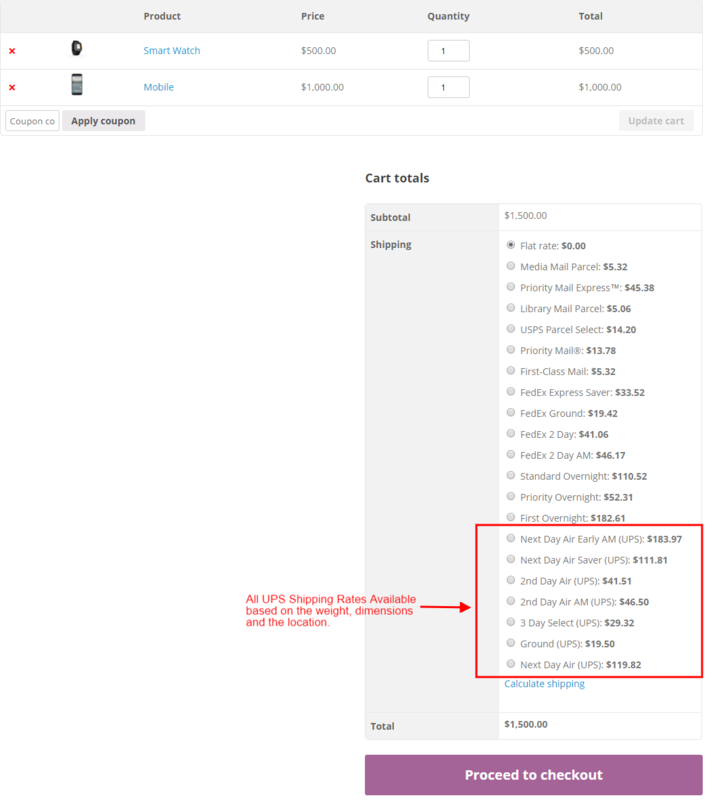 You can obtain the order edit page by navigating to Dashboard> WooCommerce> Orders> Order #. On the order overview page click on the order received so that you can open the edit order page. On the edit order page, the first thing you can go for is the Generate Package section. This basically marks the start of the process printing label. Check for billing and shipping addresses and proceed to generate package button here. Click on the button to initiate UPS package generation. As the packages are generated, they are listed in the next window that appears after package generation. The screenshot below is typical after ‘generate package’ window. Here you can make changes regarding the service. You can choose to have a different service for shipment creation. You can also make changes to the already selected boxes to fit better. And at last click on ‘create shipment’. Clicking on this means you choose the Preferred service to print the UPS shipping label. On a proper execution of this means you can print the labels. When you click on Print Label, the plugin takes few moments to return you the tracking Ids for all the packages created. The tracking Ids are automatic and are automatically sent to the customers via email. Also, these tracking Ids are specific to the service used for shipment creation. Since we used UPS, the tracking Ids are returned by UPS via EasyPost. You and your customers can use the tracking Ids manually for tracking the packages too. With this, you get the option of Print Label. When you click on the bottom, the label opens in a new tab. Each package has its own label and you can download or print the labels from the new tab. Find a sample UPS Shipping label created below. With EasyPost you can cancel the already created labels. In case of mistakes where you need to cancel the previously created labels, you get the option to create the new ones. So you can actually recreate shipments with all the three carriers. This is a distinct feature with EasyPost. ELEX EasyPost Shipping Method for WooCommerce is the junction which brings together the services from USPS, FedEx, and UPS to your WooCommece store. Not just the real-time rates, the plugin allows users to have box packing, flat rate boxes, packing, shipping, labels, and automatic tracking. Talking of the extra charges, you pay 1 cent for each label created with the plugin. Other services like tracking and address validation come without any additional charges with EasyPost. There is no other monthly or yearly subscription involved with the plugin. Also as you know that you need to have a minimum postage usage to get a discounted pricing from USPS, you get that pricing at minimal postage usage. If you think, this UPS integration is what your WooCommerce store needs, purchase the plugin or go for the Documentation for detailed troubleshooting and frequently asked questions on EasyPost and its integrations. Our Online Support is always there for your pre-sales and technical issues. Happy Selling!